Morocco is a vibrant and beautiful country. It’s one of the closest African countries to travel to from the UK, with no time difference, meaning no jet lag, that’s always a bonus! But ‘Is it safe for women travelling alone?‘ This is one of the most common questions for solo female travellers going to Marrakech. 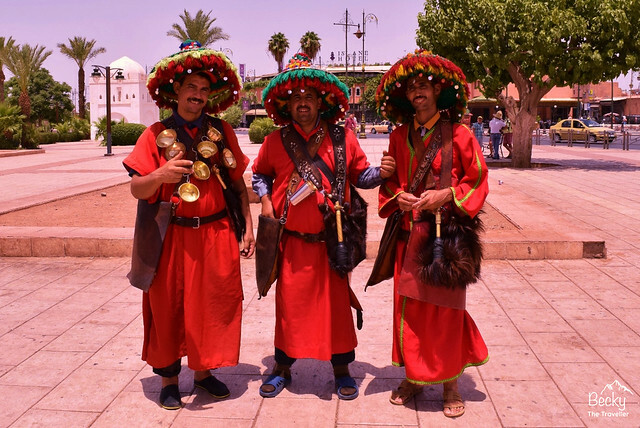 As a solo female traveller arriving at Marrakesh Menara airport you start to get the feel for the place, there’s a buzz around and you immediately feel welcomed into the city…. later to possibly be identified as the Moroccan hassle! As with any new location, arriving is when you feel the most nervous, that point when you’ve not found your bearings! I loved my time in Morocco and would definitely visit again. This is the ultimate ‘Marrakesh Guide’ for anyone travelling there to give you a bit of a heads up on what to expect from Marrakech, especially a few tips if you are a solo female traveller. Here’s my Marrakech Guide which includes top tips for solo female travellers. From Marrakesh airport, most people jump into taxis which are waiting outside. I opt for the airport bus (number 19). My first chance to try out my Arabic/French – both of which are pretty rubbish but hey the driver let me on. He’s really helpful and waves at me when we arrive at the main medina, near where my hostel is. I love that part of solo travelling, I’ve only been in the country less than half an hour and already the locals are being friendly and helpful. As a solo female traveller, I often prefer to use public transport. Why? One because it’s cheaper but two because I feel safer travelling on public transport than alone in a taxi. Ask the bus driver to tell you which stop to get off at in central Marrakech if you are worried about missing your stop. be prepared to get lost…. very lost! Exploring Marrakesh’s souks and getting seriously lost! There’s nothing more exciting than arriving at a new destination and wandering off to explore your new surroundings. If you are going to do this in Marrakesh, be prepared, you will get seriously hassle. As a solo female traveller, I literally could not walk a step with someone trying to entice me into their stall. “Come look at this… your shoes are so pretty (they weren’t)… I like your dress… where are you from”. I’m a polite person but after a day in Marrakesh, I ended up adopting the walk fast option just to escape. Even in a group, you will be hassled but alone you’re certainly targeted more since you aren’t already talking to someone! The approach of the stallholders in the Marrakech souks is direct so be prepared when you start to explore. Embrace the experience and walk confidently, even if you don’t feel like that! Take a bottle of water (it’s hot). Walk confidently, I promise you will make it out! 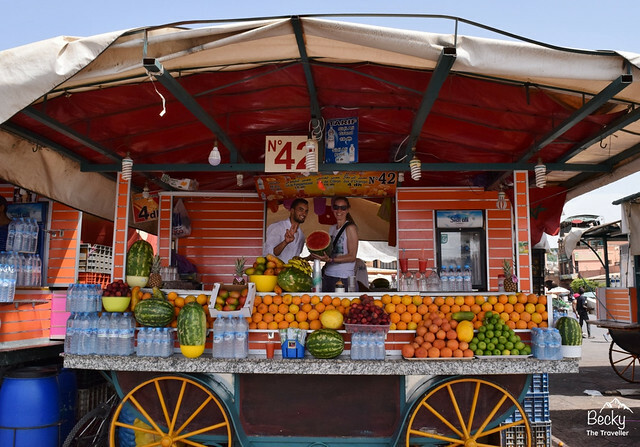 Hanging out with my favourite Orange Juice seller in Marrakesh’s Jemaa El Fna Square! For me, the Jemaa el Fna Square is a combination of things I love and things I hate. The atmosphere and buzz around the place are absolutely amazing, not to mention the fresh orange juice stalls, which for some reason there are over 20 all competing against each other. I visited the same one each day, I don’t think he remembered me but I like to think I was a loyal customer for 3 days haha! Amongst the crowds of people selling various products and services, there are sadly a few things I really hated. It’s common in the main Medina for Moroccans to dress monkeys up in outfits to pose for photos. I can’t bear seeing things like this, even worse is watching tourists handing over money, encouraging it to continue. Please think before you do this. And it’s the same with the cobras, which are drugged to perform. I don’t agree with it and it saddens me when I see so many people still lining up for photos :(. No photos are free in Marrakesh, as I found out after these guys insisted (I said ‘no thanks’ about 5 times) I take their photo, then demanded money. If you’re travelling solo it’s likely that you’ll be targeted more from these photo sellers in Marrakech! Don’t let it put you off from exploring though. Be prepared for the stallholders to approach you as you walk past the stalls. At night the Jemaa el Fna Square comes to life (even more). Metal frames are transformed into food stalls with numbers against them. They all sell pretty similar food, it’s mainly a BBQ style but there are huge menus to choose from a range of different things from. It’s great to wander around to decide where you want to eat. But some of the Moroccans can start to get annoyed if you don’t pick their stall. And I encountered some that were quite aggressive.”Come here eat my food, no you can eat more, you are too skinny you need more food……”. Arhhh chill guys! It can be a little intimidating as a female traveller on your own. Keep your bag close to you, be confident and if you feel unsure move on. Alternatively, there are many other solo travellers about so you can always buddy up with someone for the evening. As the evening continues in the Marrakech, there are people storytelling and musicians playing all in little groups over the medina, some with huge crowds and some with just a few. I preferred the smaller groups, they made you feel welcome and part of the group. Some of the larger groups came round asking for money, even when you had only just arrived. There’s no filming or photography so be prepared to be told to stop if you try…. better still enjoy the entertainment! If you’ve already eaten still be expected for the hassle. Maybe best to just avoid! Take some small change with you so you can tip the artists/musicians that you love because they don’t offer change if you only have large notes! Jardin Majorelle is a beautiful garden hidden behind a wall from the main road, it’s about 40 minutes walk from the main medina, the entrance fee is Dh70*. It is a real treat once you step inside, huge bamboo towering above you as soon as you enter. 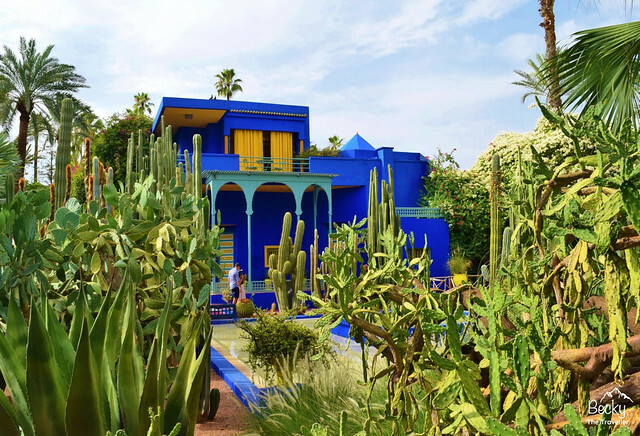 As you carelessly wander around Jardin Majorelle you forget all about the hustle and bustle of Marrakesh life outside the walls. Inside there’s also a Berber museum (you can pay extra to visit). And a café so you can take your time and spend a few hours there relaxing. On reflection from my time travelling in Morocco, like any big city, Marrakesh was a great place to visit and experience. As a solo female traveller, there was the extra effort required at times but that’s part of the experience and as long as you are sensible and prepared you will have no problems. For me though, there were other places in Morocco to explore. And it’s one of the reasons after summitting Mount Toubkal in the Atlas Mountain, instead of spending my last three days in Marrakesh. I jumped on a bus and visited a gorgeous place called Essaouira on the coast where I had a very amusing experience in my first Moroccan Hamman. Morocco is a country I would love to go back to. There’s the famous blue Chefchaouen which I would love to see. And of course, Casablanca looks amazing. If you looking for some more inspiration for your Morocco trip? 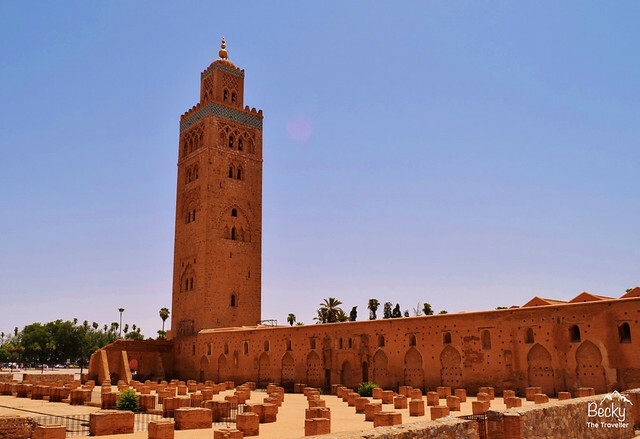 Check out Study Hard Travel Smart’s blog for tips on visiting Casablanca and of course, a tour in the Sahara Desert would be amazing. Do I think Marrakech is safe for solo female travellers? My honest opinion is that Marrakech is a safe place to visit. Although I did find it high maintenance when I was out exploring. It’s not as relaxing at times due to the amount of HASSLE I received. However, I genuinely felt the attention I received in Marrakech was all harmless but depending on how you react in those situations you may want to consider if this is the right destination for you to visit alone. Although, for my trek in the Atlas Mountains I opted to book a tour guide to lead the way! 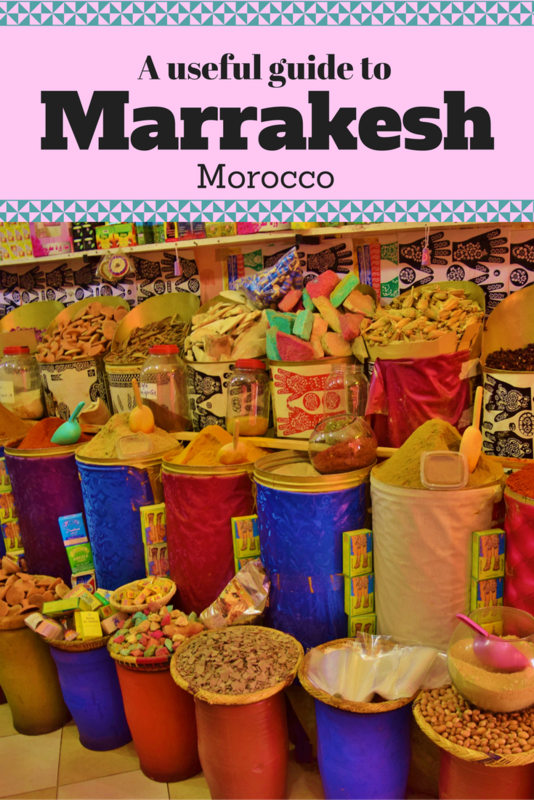 Are you visiting Marrakesh or have you already been? Do you have any more questions about solo female travel in Marrakech? Tell me about in the comments below and share any more tips for solo travellers or ask me any questions. **Marrakesh/Marrakech Guide – All prices correct at time of writing February 2017 (Updated March 2018). Cool! I’m going to Morocco sometime this year, so this is a great guide. Thanks. Ah that’s a pleasure I’m glad you found it useful. I think you’ll be fine with the selfie stick, I had my big SLR camera with me the whole time!! Ha ha I don’t think it matters what you wear. Funny I actually had a Moroccan guy hassling me on Instagram messages the other day, it obviously doesn’t matter if you’re there in person or not!! So much purple lol! Great read. Looks like an interesting place minus the typical vendors hassaring for business! Ha ha thanks Shaun, I like purple… hope it didn’t put you off!!! Yes it’s a great place to visit, you kind of get used to how the vendors hassle you, I just thought it was nice to prepare people then it’s not as much of a shock!!! I would love to visit Marrkesh! I want to wander the median! I’m pretty brace but I think I would be nervous to be there as a solo female though. Ah I hope I didn’t put you off, honestly I am sure you would be fine. I think it’s just important to act confident even if you are not and ask for help if you need it not from those that are hassling but from others. I met many a kind person, one who directed me out of the souks the first time I got lost!! Great article. We have been in Morocco last year and we LOVED IT ! Good to see others opinions about the same place. Good photos too. 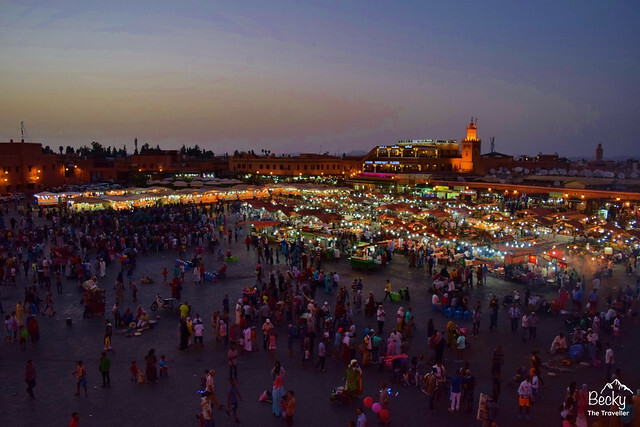 Not really been on our radar, Marrakech By Night would be a wonderful experience. Thanks for the share. Wow, this looks like an interesting trip! Good tips about taking a bus to prevent having to negotiate a taxi, and about photos not being free. The Jardin Marjorelle looks like a nice change of pace after visiting the market. Hey Becky, these are some really practical tips. A lot of them would apply to India as well. Glad you shared your experience and learning along with it. Makes it easier for anyone heading here. Well done! Marrakesh sounds like quite the bustling city! I think I’d be like you, and love the square but also hate it. Here in Mexico the vendors can be insistent in their sales pitches, but not nearly at bad as you describe! It looks beautiful though, I’d love to visit it one day. I love reading about solo adventures. I haven’t been to Morocco yet but it will likely be solo or on a photo tour. Good to know in advance that people will expect payment if you take their photo. I love street photography so that’s always challenging and a bit awkward for me. Such a great read. I would love to travel to Marrakesh and this made me more eager to go…apart from the hassle… why is there always the hassle!!!! Marrakesh always struck me as a colourful and a vibrant place. 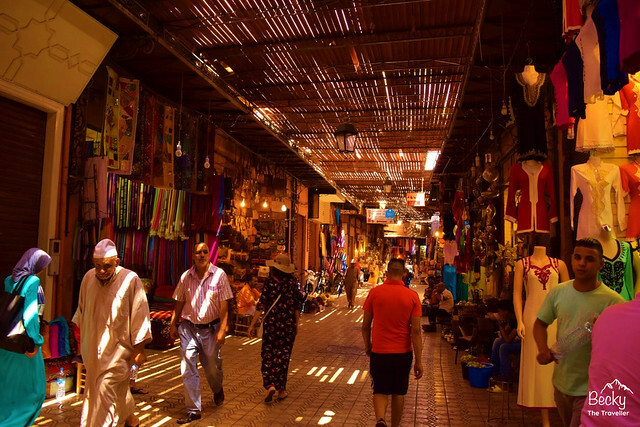 It’s lovely markets to the beautiful architecture, Your tips for travel are indeed sensible and practical and sure to make the Marrakesh experience something to cherish for a long, long time. Miss the vibe from there!! Your pictures are beautiful. I completely enjoyed going through your post and some of the tips are really really helpful. My personal opinion is that these business vendors push you for buying in all the countries and it is damn annoying. Ah thank you so much, glad my tips were helpful. I completely agree that you have people push you into buying their products, I have experienced this myself too but I think Marrakech has to be the worst so far!! I know they are doing it because they are promoting their business but if they chilled a bit more I would be much more inclined to browse in the shops and maybe even buy things! Some good tips, especially about being prepared to pay everyone for everything! I remember walking past a band playing in Jemaa el Fna, I glanced at them, they then insisted I tip them as I’d looked! Is the dentist guy still there? That garden looks amazing – I love the blue building set in the green gardens. And you’re right about visiting Essaouira – a lovely town. Toubkal mountain is also great! Hi Emily, great thanks, yes useful to know about having small change. ha ha so funny I remember to dentist, I actually took a photo of all the teeth and no one was there but as soon as he heard the click he came running over. I just offered to delete photo, what was I ever going to do with it ha ha!! Jardin Marjorelle is gorgeous, would recommend a visit if you are going back, so relaxing too. Did you climb Mt Toubkal too? I am just writing my post about my adventure! Bookmarked this, Becky! I plan to go to Morocco this year as part of my travel bucket list this 2017. I usually travel alone as a backpacker and being female, this article sounds interesting and helpful for me. Aside from Marrakesh, any other points of interest you would like to recommend? Hi Monica, that’s great to hear, whenabouts in 2017 are you hoping on visiting? Glad you found it useful, I think a lot of things you figure out after a day or two but sometimes it’s just nice to know a bit more information in advance! I also did a trip in the Atlas Mountains, climbing Mt Toubkal if you like adventures. I am just writing my blog post on so feel free to look out for that in the next week or so. I also visiting a place called Essaouira, my recent blog post on visiting a Moroccan Hamman/Spa shows a couple of photos from there but again I will be writing up about soon. I would defintely recommend a visit, it’s a lovely little place, like a mini Marrakech but also on the coast so has a great fishing market too. Man, this is good timing! I’m heading there next week, so I’ll definitely be kindly bookmarking this page! Ah that’s fantastic, hope you have an amazing time. Be sure to check out my other post on trying a Moroccan Hamman, that’s an experience you should defintely try! Hello! Someone in my Facebook gfoup shared this website with us so I came to look it over. followers! Fantastic blog and great style and design. Solo traveling is very difficult for female solo travelers. You share the information is really very helpful for solo female travelers. Nice information. Thanks!